Xánath Caraza. Sandra Kingery, translator. Mammoth Publications: Lawrence, KS. 2014. I would suggest that Caraza is being modest. She is an accomplished poet who controls each of her poems in the collection. There is, however, a powerful sense of movement throughout the collection as she travels from Mexico to Europe, lingers in Spain, then returns to Kansas City with other stops along the way. This sense of movement is not just from the poems themselves, but because she has carefully included the date and location of the poem’s origin at the end of each. Her themes are timeless: life, death, and what happens between. Her style is lean and direct. Simple, colorful language describes what she sees and feels on this whirlwind trip. There is only punctuation in a few of the poems, and then only minimal. Each line begins with a capital letter. These techniques challenge the reader to follow her lines carefully. These are also the kinds of devices which pose particular challenges for a translator. But Caraza and Kingery seem a match made in heaven as the translator has created lines that are to equal their originals. Mr. Smith Goes to Washington was translated into Spanish as Mr. Smith Va A Washington. Even those who do not read Spanish can guess that title. This would be an example of a very literal translation. The Sound of Music, on the other hand, became La novicia rebelde (The rebellious novice) in Latin America and Sonrisas y lágrimas (Smiles and tears) in Spain. These titles may have helped box office sales, but are far from the original title and, perhaps in the case of the rebellious novice, far from the theme of the film itself. These titles would fall into the category of more creative interpretations of the original. A quick skim shows that, on the page, the poems look very similar in terms of line length, number of stanzas, etc. And certainly, “Aves de coral de lapislázuli y jade” easily find there equivalents in “Birds of coral, lapis lazuli and jade”. In the following stanza however, Kingery exercises her poetic license with the phrase “de plumaje de palabras.” A literal translation would be feathers of words, but she has carefully substituted “phrases” to achieved the same alliteration as the original. In the following line “de plumaje de humo” (feathers of smoke) she changes smoke to “fire” for the same alliterative effect. And in the final line of the stanza “texto silencioso” becomes “silent script” to once more take advantage of the alliteration in English. In addition to the above techniques, which the translator uses throughout the text, she has also maintained some words in their original, especially words of Nahuatl origin. Context helps the reader guess the meaning. This preserves a taste of the original, without sacrificing content. Three of the poems, in fact, appear in their entirety in their Spanish original with both English and Nahuatl translations following. While “Full of sparks you are” is faithful to “De centellas lleno estás” it would be more fluid in English to say “You are full of sparks” a simple deviation from the original with no loss of content. 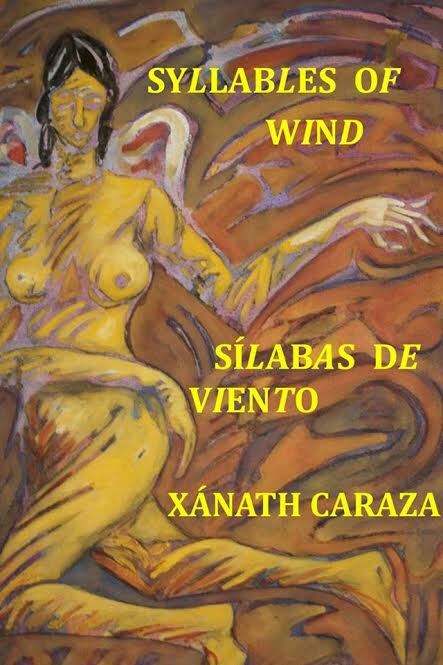 Sílabas de viento /Syllables of Wind is a fine work of poetry by an experienced poet and an equally talented translator. It’s a great read in both languages.